"Pop psychologists" often like to discuss the power of perspective by referring to the glass half empty verses the glass half full. Alas, it is a common human trait to look for the negative, but those who look for the positive often have a far more enduring legacy. For the last eight years, amidst a plethora of voices on social media, Jewish Treats has constantly reflected positive, joyous Jewish life. Following the path set by our parent organization, NJOP, and its indefatigable Founder and Director, Rabbi Ephraim Buchwald, Jewish Treats has offered almost 2,000 original "juicy bits of Judaism daily." And we have loved every minute of it! On our eighth anniversary, Jewish Treats wants to thank you for your ongoing interest and support. We look forward to sharing more tantalizing treats, and encourage you to share them with your friends and family. Note from the Director:NJOP thanks the remarkable woman behind Jewish Treats, Sarah Rochel Hewitt. Send us your thoughts and questions. Email jewishtreats@njop.org and tell us your favorite Jewish Treat and why. One might easily think of the mitzvah of mezuzah as a passive mitzvah. One simply affixes it to the doorposts of one’s house while reciting a blessing, and it is done. While affixing a mezuzah is a one time act, its position on the doorposts is meant to lead one to a continual awareness of the Divine presence. For this reason, there is a custom to either look at/touch/kiss the mezuzah as one passes by. So which is it? Does one look at, touch or kiss the mezuzah? The answer is that it depends on one’s family or community’s custom. Many people cite the source for touching the mezuzah back to a story about Onkelos in Talmud Avodah Zarah (11a). When the emperor’s soldiers come to retrieve him (click here to find out why), he placed his hand on the mezuzah and asked if the soldiers know what it means. When they inquired, he used it as an opportunity to explain how God perpetually watches over the Jewish people. The guards were so impressed that they converted to Judaism. The custom of kissing the mezuzah, which usually means touching the mezuzah and then kissing the fingers that touched it, is not mentioned until the era of Rabbi Isaac Luria (16th century, Arizal). It is a further means of demonstrating not only one’s awareness of God, but one’s love of the Divine as well. Make an effort to be aware of passing a mezuzah. Remember that God created the entire world, both that which we understand and that which remains a mystery. When Air France Flight 139 left the Tel Aviv airport on the afternoon of June 29, 1976, the passengers and crew could not have imagined the terrifying, yet heroic, events of which they would be a part. The flight flew from Tel Aviv to Athens, and, after a quick refuel, was on its way to Paris. The four terrorists who boarded in Athens, however, had other plans. Not long after the plane began to cruise, the terrorists forced the pilot to redirect the flight to Uganda, an African nation controlled then by the ruthless dictator Idi Amin, who gave the hijackers his full support. The passengers were taken off the plane at a disused airport terminal in Entebbe. The terrorists, members of the Popular Front for the Liberation of Palestine, demanded $5 million USD and the release of 53 Palestinian or Pro-Palestinian prisoners by July 1st. As the diplomatic shuffling began, the terrorists separated the Israeli passengers, approximately 105 people, including a few non-Israelis and the crew, from the rest of the passengers. The non-Israeli group of hostages was released over the next few days. Over 200 commando troops were flown to Uganda, traveling seven and a half hours under the radar of un-friendly territory. They landed and approached the terminal in what appeared to be Idi Amin’s personal convoy and snuck into the building. Once they were detected, a firefight broke out. Three passengers were, unfortunately killed, but the vast majority made it home. Many Israeli soldiers were wounded, but only one, unit commander Lt. Col. Yonatan Netanyahu (brother of the current Israeli Prime Minister, Benjamin Netanyahu) , was killed. Operation Thunderbolt, as it was officially called, is often referred to as Operation Entebbe or, more recently, as Operation Yonatan in honor of the raid’s fallen leader. Take the time to study self-defense. Those who enjoy travel, love to hear tales of adventurous backpackers who head off into “parts unknown” without a clear plan of action. Most people, however, would not travel without a plan - even the most basic itinerary such as a list of sites one would like to visit. When the Israelites followed Moses out of Egypt, they had no plan, only the hope of following Moses to the Promised Land. The journey, perhaps, could have been straightforward (there were, after all, active trade routes), but God had different plans and implemented His own Global Positioning System to guide the Israelites through the Wilderness. They were guided by the movement of the Clouds of Glory. On the other hand, by following the Clouds of Glory, the Israelites were better able to recognize God’s leadership, particularly as they had no foreknowledge of when they would be traveling or to where. As it is written in the Book of Numbers: “Sometimes the cloud tarried on the Tabernacle many days, then the Children of Israel kept the charge of the Lord and did not journey. Sometimes the cloud was a few days upon the Tabernacle...and sometimes the cloud was from evening until morning" (Numbers 9:19-21). The Children of Israel have come a long way since their travels in the Wilderness, but the lesson that can be learned from God’s “Cloud Positioning System” is one that is relevant even today. Every person’s journey in life, no matter how free-flowing it may appear, is guided by the hand of God. Be mindful of God’s hand in your life. June 23rd is the official date recognized by the United Nations as International Widows Day. The day was first observed in 2005, and, in 2010, it was ratified by the U.N. to address “the poverty and injustice faced by millions of widows.” Too often, particularly in agrarian societies, the death of a woman’s husband leaves her without a means of support or at the mercy of others who have a claim on the estate. In Jewish law, a marriage is made official by means of a ketubah, marriage contract, which establishes the support that husbands are required to provide their wives. If a husband passes away, the support is expected to come out of the deceased’s estate. This is important because according to the Jewish laws of inheritance, a man’s estate normally goes to his son(s). While one would hope that these sons would be naturally inclined to support their mother, that is not always the case. This law also provides protection for widowed step-mothers, who might otherwise be cut off by their step-children. One of the most interesting aspects of the mitzvah not to oppress the widow is that, whereas one may think that these rules are only directed at widows who face impoverishment, it applies to all widows, no matter what their socio-economic status may be. The protection of a widow, and orphans, is not only a question of financial support. According to Rabbi Samson Raphael Hirsch (Germany, 1808-1888), the word almanah (widow) is related to the word illem, which means “dumb” or unable to speak, because the widow loses her ability to speak to the world on her own behalf. “It [the law] says any widow not only poor, even rich widows and orphans are easier to be taken advantage of and misused, than other people” (Rabbi Samson Raphael Hirsch, commentary on Exodus 22:21). Be aware of people in your community who may need a helping hand and see how you can help them. The tradition of engaging in levity to bring joy to the bride and groom is an ancient one. Indeed, the Talmud (Ketuvot 17a), mentions Rabbi Samuel the son of Rabbi Isaac who was known for juggling myrtle twigs before the bride. While his peer, Rabbi Zeira, felt that this debased the scholar’s honor, Rabbi Shmuel was greatly honored for his efforts to fulfill the mitzvah of simchat chatan v’kallah. If you attend a wedding, focus on what will make the bride and groom happy. While Jewish prayer has many aspects that are introspective, prayer is also designed to serve as a vehicle of communication with the Divine. The central focus of every prayer service is the Amidah, which means standing, a prayer that, during the weekdays, consists of 19 blessings of praise, supplication and gratitude. During the recitation of the Amidah, it is customary that one stand erect with feet together - reminiscent of the stance of angels. When reciting the Amidah, one should have the mindset of truly standing before the King of kings. For this reason, tradition suggests a proper way of approaching the Amidah, which is to take three steps forward into the posture of prayer. An additional custom has developed to take three steps back prior to taking the three steps forward, which apparently derived from the practical need for the space in which to move forward. At the conclusion of the recitation of the Amidah, when one is ready to withdraw from the Divine communion, it is customary to take three steps backward and bow to the left, right and center while reciting: “He Who makes peace in His heavens, may He make peace for us and for all Israel, and let us say Amen.” This follows the dictates of the Talmud: “Rabbi Alexander said in the name of Rabbi Joshua ben Levi: One who prays [the Amidah] should go three steps backward, and then recite ‘peace.’ Rabbi Mordecai said to him, ‘Having taken the three steps backward he ought to remain standing, as should a disciple who takes leave of his master’” (Talmud Yoma 53b). Numerous explanations have been given for the significance of the number three. The most basic purpose of this movement, however, is that it creates a separation between that which is mundane and that which is holy. Make it a point to clear your mind and focus before reciting prayers. Make a donation to support your local synagogue. In honor of Father's Day, Jewish Treats presents this classic Treat on the importance of a father. Where does a child learn to be a mentsch (a good person)? From his/her parents! Indeed, in the Talmud (Sukkot 56b) it even notes that a child repeats in the streets what he/she hears at home. According to Dr. David Pelcovitz (author of Balanced Parenting), research studies have found that the active involvement of both parents in a child’s moral education is the strongest predictor of children's moral reasoning and empathy as they grow older. In the traditional family model, in which mom tends to have the central role in parenting (i.e. spends a lot more time with the kids), it is important to note that these studies have found particular importance in dad’s involvement. According to the sages of the Talmud, after circumcision and Pidyon Haben (redemption of the first born son), a father’s primary responsibilities are to teach the child Torah, to find him/her a spouse, and to teach the child a trade. Some say, to teach him/her to swim too (Kiddushin 29a). At the bare minimum, his fatherly obligations are to make certain that the basic necessities of child-rearing are attended to (by a third party if necessary). But, the best child-rearing includes dad sharing his time, knowledge and wisdom, and truly leaving a lasting and meaningful impression on his children. This Treat is reposted each year in honor of Father's Day. Express your gratitude to the father figures in your life. One of the most common ways of addressing God in the Jewish liturgy is Avinu, our Father. By addressing God as Avinu, one can not only learn about humanity’s relationship with God, but also about Judaism’s view of fatherhood. From the perspective of a child: Obviously Judaism does not expect a child to make his/her father into a god...but the Torah commands a child to both honor and revere his/her parents. One can learn how to fulfill these commandments by reflecting on the way one is supposed to relate to God. For instance, just as one does not take God’s name in vain, a child is prohibited to refer to a parent by his/her first name. When it comes to religious reflection, Jewish tradition notes that most people’s relationship with God is based on reverence (yee’rah) before love (a’hava). Ideally, each person is supposed to work on serving God out of love. Similarly, the sages notice that a father-child relationship often has more fear/reverence in it, while a mother-child relationship has more love (see Kiddushin 31a). A child must therefore seek to look beyond the father’s role as rule-maker/ disciplinarian to feel the same love for one’s father as for one’s mother. This Treat was last posted on June 21, 2010. Don't wait for Fathers' Day (or Mothers' Day), make honoring your parents a part of every day. Don't judge a person by what you see them giving or doing. When the European Wind Energy Association launched the first Wind Day in 2007 (which became Global Wind Day in 2009 in coordination with the Global Wind Energy Council), it was probably not familiar with the fact that Jewish tradition discusses wind as one of the constant, dependable forces of creation. Many of the Global Wind Day (June 15) events demonstrate the incredible potential of harnessed wind energy. In Tractate Ta’anit of the Babylonian Talmud, the sages discuss the nature of wind: “It has been taught, the sages did not make obligatory on one to mention [in the daily prayers] dew and winds, but if one desires to mention [them] one may do so. What is the reason? Rabbi Chanina said: Because they are never withheld” (Ta’anit 3a). God might hold back the rains or obscure the sunshine (too much rain), but the wind is a constant. Jewish tradition often discusses winds by the direction from which they come. An east wind not only split the Sea for the Israelites, but brought the locust into Egypt during the Ten Plagues (whereas a west wind swept them away). Rabbi Nachman ben Isaac observed that “legal study requires as much clearness as a north wind day” (Talmud Eiruvin 65a). Wind, as the energy companies know so well, is a powerful force. It is stated in the Book of Ecclesiastes: “There is no person who has power over the wind, to retain the wind” (Ecclesiastes 8:8). Whereas humankind’s behavior and prayers can effect rain, tradition maintains that this is not the case with wind. So while the inherent energy of wind can be harnessed, it cannot be stopped. When walking in the sun and enjoying a cool breeze, remember that the wind is a Divine gift. In honor of World Blood Day (June 14), Jewish Treats takes a brief look at the Jewish researchers who made safe blood transfusions possible. In 1901, Karl Landsteiner (June 14, 1868 - June 26, 1943) discovered that people have different types of blood, and by 1909 he was able to begin labelling the different blood types. Born in Vienna, Landsteiner attended the University of Vienna, where, after several years of outside research, he became a professor. In 1919, Landsteiner moved to The Hague, from where he was recruited in 1922 by the Rockefeller Institute for Medical Research in New York. Receiving the Nobel Prize for Physiology/Medicine for his work on blood types in 1930, Landsteiner was involved in important research in immunology, pathology and hematology. During his work at the Rockefeller Institute, he collaborated with two other well-known Jewish hematological researchers, Alexander Wiener and Philip Levine. Alexander Solomon Wiener (March 16, 1907 - November 6, 1976), a life-long New Yorker, was the son of Russian Jewish immigrants. At 15, he received a scholarship to Cornell University. Afterward, while attending the Long Island College of Medicine, Wiener began doing research on blood groups at the Brooklyn Jewish Hospital alongside Landsteiner. While working on creating a blood “fingerprint,” they discovered the RH +/- factor. They named this blood factor RH in honor of the Rhesus monkeys that they used as test subjects. It was Wiener who was responsible for recognizing the trouble that incompatible RH factors caused in blood transfusions; RH+ given to an RH- patient will cause the creation of dangerous antibodies. An interesting sidenote: Due to his research furthering the development of forensics and criminal identification, Wiener was made an honorary member of the Mystery Writers of America. Philip Levine (August 10, 1900 - October 18, 1987) moved to New York from Kletsk, Russia, when he was 8 years old. He attended City College and Cornell University, after which he worked as Landsteiner’s assistant. From 1932 - 1935, Levine led a research team at the University of Wisconsin in Madison, but returned east for a position at Newark Beth Israel. Based on the research findings on RH+/-, Levine hypothesized correctly that this was the cause of hemolytic disease of newborns. Together with Wiener, Levine created a transfusion procedure that saved the lives of an untold number of infants. Do not hesitate, if you are able, to donate blood. Ruth was the Moabite wife of Machlon, one of the sons of Elimelech and Naomi, a wealthy couple who had fled Bethlehem during a bitter famine. Elimelech's family had settled in Moab, a neighboring country with which Israel had a history of conflict. When Elimelech and his two sons died, Naomi chose to return to her homeland. Her two daughters-in-law, Ruth and Orpah, decided to go with her. When they reached Israel, however, Naomi urged them to go back to their fathers’ homes. Orpah did leave. Ruth refused, declaring: "Where you [Naomi] go, I shall go, your people will be my people...your land will be my land, and your God will be my God" (1:16). Upon their return to Bethlehem, Ruth and Naomi lived a lonely and impoverished life. People resented that Naomi’s family had fled the famine, and they did not trust her Moabite daughter-in-law. To keep from starving, Ruth gathered excess barley that fell during the harvest in the field of Boaz, a relative of Elimelech. Boaz noticed Ruth’s unique qualities of modesty, loyalty and humility and encouraged her to continue gleaning in his field until the end of the harvest. In the meantime, the elders of Bethlehem debated whether Ruth was a true convert and whether she could marry a Jewish man. Naomi, however, knew that Ruth was devout and sincere. She directed Ruth to go to the ceremony at the close of the threshing and seek out Boaz, who had been so kind to them. She told Ruth to present herself to him as a potential mate and assured Ruth that Boaz would take care of her. That night, Ruth demurely waited at Boaz’s feet, signaling her intentions. Boaz, who was much older, an established landowner and a leader in the community, had not thought of himself as a possible suitor until that night. Boaz and Ruth married and their son, Oved, was the grandfather of King David.The Book of Ruth is read on Shavuot. This Treat was last posted on May 22, 2015. The Torah was given to the Jewish nation in the midst of the wilderness on a tiny mountain called Sinai. Throughout the Torah, however, there is much focus on the “Promised Land” and the mitzvot that can only be performed when the Israelites settle the land. 2) Attaining possession of the Holy Land is a great reward. The Israelites spent their time in the wilderness preparing themselves, studying and practicing the laws of the Torah. The books of the Prophets, which record the history of the Jewish people following their entry into the Promised Land, teach that whenever the people strayed from the Torah, the land was conquered and the people subjugated until they mended their ways. There is no question that the Jews are bound to the Land of Israel. This fact is evident throughout the Bible, the Talmud, the liturgy, and the extensive canon of Jewish writing. Judaism, however, is bigger than a particular location. Judaism is a way of living wherever a Jew may be. This Treat was originally posted on May 18, 2015. 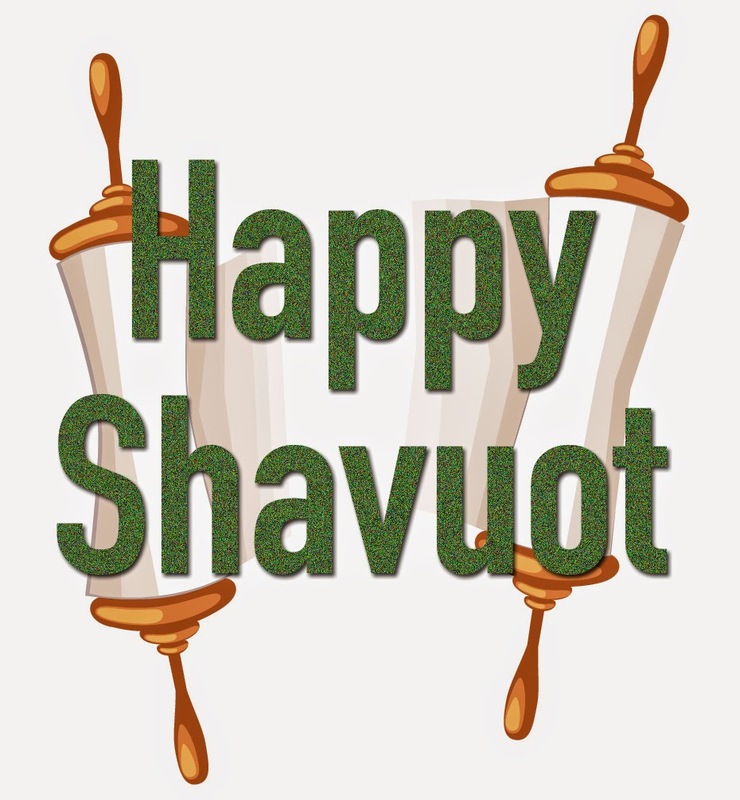 Jewish Treats and NJOP wish you a Shabbat Shalom and a happy Shavuot. Today is the first day of the Sh'loshet Yemei Hagbalah, the three days of preparation. 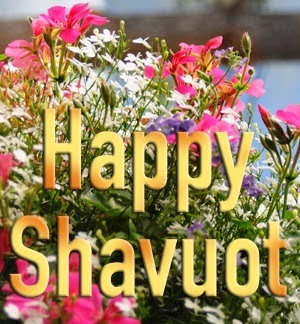 The holiday of Shavuot, which commemorates the receiving of the Torah, begins on Saturday night, immediately after Shabbat. Treat was last posted on May 21, 2015. Prepare for the holiday of Shavuot by clearing your schedule. On the first day of Sivan in the year 2448 (Jewish calendar), only seven weeks after leaving Egypt, the Israelites reached the Wilderness of Sinai. On the desert plain around the mountain, they set up camp and watched as Moses set off toward the mountain to hear God's will. You have seen what I did to the Egyptians, and how I bore you on eagles' wings, and brought you to Myself. Now, therefore, if you will listen to My voice and keep My covenant, then you shall be My own treasure from among all peoples; for all the earth is Mine; and you shall be unto Me a kingdom of priests, and a holy nation (Exodus 19:4-6). On that day, 2 Sivan 2448, the Israelites made the most monumental decision in history. They chose to become a people with a distinct and direct relationship with God. They chose to become God's servants, to follow His rules and to faithfully serve Him. They chose to strive for holiness. On the second of Sivan, they chose to be “chosen” when they responded with one voice: “All that God has spoken we will do” (Exodus 19:8). The second day of Sivan is not marked as a holiday, as is the sixth of Sivan (Shavuot), the day on which the Israelites actually received the Torah. However, to honor the agreement that was presented and accepted on this day, the second of Sivan is known as Yom Ha'meyuchas, the Day of Distinction. This Treat was originally posted on May 20, 2015. But ownership of the land is not the only criteria. “These may not bring them [bikkurim]: He who plants on his own soil, but sinks [a shoot] so that [it] nourishes from the territory belonging to an individual or to the public...[or similarly]...so that it grows on his own property”(Bikkurim1:1). In other words, this mitzvah can only be performed by one who makes certain not to infringe on the property rights of others or the public. This Treat was last posted on May 19, 2015. Spend time thinking about your relationship with God. 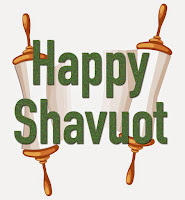 Shavuot, which we begin celebrating Saturday night (June 12th), is the only holiday in the Torah not listed by the date on which it is to be observed. Rather, the Torah teaches that this festival takes place on the day following the 49th day after the first day of Passover (see Counting of the Omer). The name Shavuot, therefore, reflects the fact that this holiday occurs seven complete weeks (shavuot) after Passover. In mystical terms, the number 7 represents the natural order of things, and so, a complete, natural cycle has occurred. The natural cycle that has been completed is agricultural. Therefore the holiday is also called Chag Ha'bikurim, The Holiday of the First Fruits, and is the time when the offering of the First Fruit of the harvest was brought to the Holy Temple in Jerusalem as a gesture of thanksgiving for the successful crop. Seven times seven days, the count of 49, expresses the natural cycle, but Shavuot takes place one day after the seven weeks--one step beyond the natural cycle. It is, therefore, also representative of an event beyond nature. When the Israelites left Egypt, the people acted as though they were merely cousins bonded by mutual misery. By the end of seven weeks, however, at the base of Mount Sinai, the former slaves rose above their normal human limitations and, by accepting the Torah, took upon themselves a total commitment to God, the final step in becoming the Nation of Israel. Shavuot is therefore also known as Z'man Matan Torateinu, the time of the giving of our Torah. 1) I am the Lord your God and 6) Do not murder: When someone murders another person, the perpetrator, in effect, denies that the victim is created b’tzelem Eh'lokim, made in the image of God. A murderer assumes that there is no higher power who will either punish him/her or who will punish the person whom he/she feels has wronged him/her. This Treat was last posted on February 9, 2013.
Review the Ten Commandments before Shavuot. This Treat was last posted on May 18, 2015. This Treat was last posted on May 21, 2015. 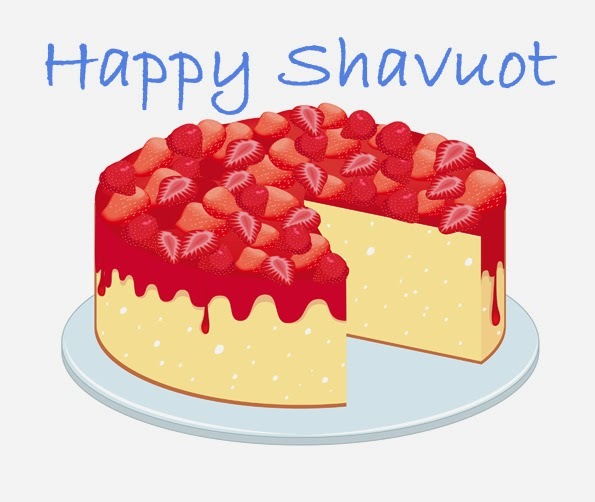 Prepare for Shavuot by buying or making a cheesecake (for those who can't eat dairy, look online for non-dairy recipes). There is an oft-cited Midrash (Sifrei, Dvarim 343) describing how God offered the Torah to the other nations of the world before He gave it to the Jewish people at Mount Sinai. According to this Midrash, the first nation to whom He offered the Torah asked what was in it. When God told them about the law prohibiting stealing, they couldn’t fathom a life without theft. The next nation reacted incredulously to the prohibition of adultery; they were horrified at the idea that God would monitor people’s bedroom behavior! Another nation was unable to accept the prohibition of murder...and so on. When God asked the Jewish people if they would accept the Torah, there were no questions. They declared: “Na’aseh v’nishma” (“We will do and we will listen”). So, if one understands the Midrash correctly, it sounds like the so-called “chosen people” were God's last choice for receiving the Torah. However, God understood that, unlike the other nations, the Israelites were truly free to accept the Torah since they did not yet have a homeland, they did not yet have an existing government, culture or “way of life.” It was this freedom that God gave them when He brought them out of Egypt into the wilderness that made the Jews more inclined to receive the Torah. They were not chained to a pre-existing life-style and thus were not reluctant to change themselves for the better. Perhaps this is the practical reason why the Jews were able to accept the Torah so readily. One must also bear in mind that the Israelites still remembered the generation that had come to Egypt and those who had been enslaved. They still claimed the spiritual heritage of Abraham & Sarah, Isaac & Rebecca, and Jacob, Rachel & Leah. It is this heritage that we have today. On Shavuot we commemorate the day that God gave the Torah to our ancestors. Now the choice is ours. This Treat was last posted on May 28, 2014. Sign up for local classes to learn more about Judaism. New York may be the city that never sleeps, but Jerusalem is the “City of Gold.” This description usually refers to the city’s physical appearance (casting a golden light at dusk due to the unique Jerusalem stone with which its buildings are built). The heart of the city is the “Old City,” “Ha’ir ha’atika.” As ancient as the walls of the Old City may appear, the Old City is NOT the original city in which King David dwelled. The City of David (Ir David, as it is called today) now being extensively explored and excavated, is to the southeast of the current Old City, although the Temple Mount is part of both cities. The current Old City encompasses the Temple Mount (known in Hebrew as “Har Ha’bayit,” The Mountain of The House) and its Western Wall (aka Wailing Wall, Kotel Ha'Ma'aravi), as well as the area to its west and north. It is a treasure trove of Jewish history. In the 1970s, archeologists discovered and excavated the wall built by King Hezekiah to protect Jerusalem from the Assyrians, and the Cardo, the famous central road from Roman times. Other archeological sites in the Old City, include Wilson’s Arch and the remains of priestly houses from the era of the Romans. The famous walls that surround the Old City today were erected by the Ottoman Sultan, Suleiman the Magnificent, in the mid-sixteenth century C.E.. This enormous structure, with its 11 grand gates, encompassed structures from many previous eras in history, including the Temple Mount upon which stands the Al-Aqsa Mosque that was built in 705 C.E. The Old City is divided into four quarters (Jewish, Armenian, Christian and Muslim - named for their local residents). The Jewish Quarter is the most modern quarter. Most of it was destroyed between 1948 and 1967, after the Jewish population of the Old City was taken captive and driven out of the city by the Jordanian army. During the Six Day War of 1967 (on the 28th of Iyar), the Israeli Defense Force took back the Old City and began rebuilding the Jewish Quarter. This Treat was last posted on June 1, 2011. In 1947, when the United Nations approved the plan to partition the British Mandate of Palestine (Israel) into a Jewish state and an Arab state, they determined that Jerusalem would be an “international city” for a period of ten years. The plan was approved by the Jews, and the day after it came into effect, the new state was attacked by the surrounding Arab states (as the Arabs had not accepted the Partition Plan). At the time of the cease-fire that ended the 1948 War for Independence, Jordan was in control of the Old City and eastern Jerusalem. Jews lost all access to the Western Wall, the holiest site of the Jewish faith as it is the last standing structure from the retaining wall that supported the Holy Temple, and nearly all of the Jewish Quarter of the Old City was destroyed. On June 5, 1967, the Middle East was once again at war. The war itself lasted six days, but on June 7, 1967 - 28 Iyar 5727 - Jewish troops took the Old City and, for the first time in almost twenty years, Jewish prayers were recited at the Western Wall. This year, 28 Iyar coincides with Sunday, June 5th. This Treat was last posted on May 8, 2013. If you have a local kosher food store, buy some Yerushalmi (Jerusalemite) Kugel for this Shabbat. “Pop psychologists” often like to discuss the power of perspective by referring to the glass half empty versus the glass half full. Alas, it is a common human trait to look for the negative, but those who look for the positive often have a far more enduring legacy. For the last eight years, amidst a plethora of voices on social media, Jewish Treats has constantly reflected positive, joyous Jewish life. Following the path set by our parent organization, NJOP, and its indefatigable founder and director, Rabbi Ephraim Buchwald, Jewish Treats has offered almost 2,000 original “juicy bits of Judaism daily.” And we have loved every minute of it. NJOP thanks the remarkable woman behind Jewish Treats, Sarah Rochel Hewett. Once a week, take a few moments to think about how you can become a better you. The penultimate chapter of the Book of Leviticus begins with a description of the myriad benefits of following in the path of the Torah. Some of the promises include: rains in their proper season (26:4), peace in the land (26:6) and the ability to “eat old grain and remove the old to make way for the new” (26:10). The second half of the chapter, however, records the terrible price to be paid for departing from the path of Torah. These include illness (26:16), infertile lands (26:20) and war (26:25). This chapter is both inspiring and intimidating. Most significantly, the entire chapter is written in second person plural. The blessings and curses, mapped out in Leviticus 26, and read as part of Parashat Bechukotai, are addressed to the Children of Israel as a whole. The significance of this fact underscores one of the reasons why Jewish unity is so important. According to Jewish tradition, the destruction of the Second Temple and the current diaspora that the Jewish people have experienced for the last 2,000 plus years is primarily a result of a lack of unity. Beyond interpersonal disputes, there was, at the time of the Second Temple, a terrible amount of infighting; Saduccees verses Pharisees and zealots fighting the Romans against those who wished to make peace. Some of the terrible curses of Leviticus 26 seem to have come to pass, and yet the Jewish people continue to frequently strive against one another. History is full of the sad tales of Jews putting their differences first, with tragic results. However, it is also full of wonderful instances where Jews came together and reflected to incredible strength, and beauty, of Jewish unity.